Are you looking for the best dessert spots in Boulder? We've got you covered. Boulder is an energetic city filled with friendly people, tons of hiking trails, and most importantly, delicious and innovative dessert spots. The University town has everything from fresh gooey cookies to gourmet popsicles. Check out our top 10 favorite sweet spots in this bustling city. With beautiful decor, a huge collection of teas from all over the world and delicious desserts, The Dushanbe Tea House is a must visit while in Boulder. The Tea House was dedicated to Boulder by the Mayor of Tajikistan, Maksud Ikramov. More than 40 artisans in different cities of Tajikistan contributed to the art and design of the Boulder Tea house including the bright Persian inspired ceiling. The Tea House is constantly creating new and innovative desserts. The Chocolate Pot de Créme or Flourless Orange Cake Napolean were our favorites! T & Cakes is a cute little cupcake shop on Pearl Street outdoor mall with freshly baked sweets and savory good each morning. They are known for their chocolate maple bacon cupcake with moist chocolate cake iced with thick maple cream frosting and topped with candied bacon. However, the shop offers tons of other flavors such as carrot cake and cookies in cream. T & Cakes also has a selection of cake pops and gluten-free treats! Go for the pizza, stay for the dessert! Pizzeria Locale has a few dessert items that we fell in love with, including the 'Saltimbocca con Nutella', freshly baked pizza dough sliced open, spread with Nutella and topped with powder sugar. This mini dessert pizza is served hot and the is so good, you'll want to order two! The restaurant also offers a dessert called the 'Budino', a creamy, nutty butterscotch pudding topped with thick chocolate ganache. fresh cream and chocolate shavings. With two boulder locations, Sweet Cow is a sweet spot for locals! All of their ice cream is made on site in small batches and served fresh each day so the flavors are rich and creamy. Try their sundaes or opt for a salty sweet combo and order a pretzel cone. Looking for the best cookies in Boulder? 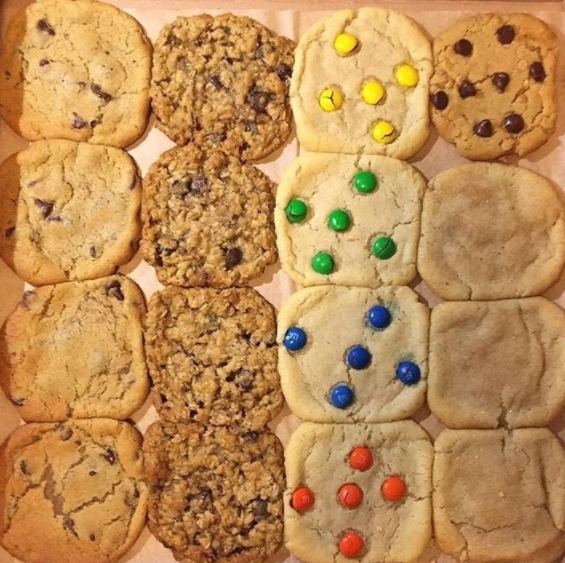 Boulder Baked has the hot, freshly baked and gooey cookies and cookie cakes for any occasion. A favorite among University students, the shop is open until midnight and delivers to you while you're studying! They also have care packages and other comfort food like mac and cheese. Everything is made from scratch and the menu even has some vegan and gluten free options on it. This shop was made for chocolate lovers! Walk in to a little magical shop filled to the brim with chocolate truffles, bars, gift baskets, cookies and more. The shop is fueled by Owner and Chef Sarah Amorese and her staff, some of the best bakers and chocolatiers in the state. Piece, Love & Chocolate prides themselves on crafting the best chocolates and bringing innovative flavors to the city. For example, they have a truffle called the 'Left Hand Brewery Milk Stout Ganache' with creamy ganache infused with smooth Left Hand Milk Stout from the local brewing company. They also have fun classes and events so make sure to check their website to see what's poppin'. Head to this pink and purple shop for a fun night of Fro Yo. Get ready to take your time perfecting the perfect frozen yogurt sundae because at Ripple, the options are endless! The shop prides themselves on providing the city deliciously healthy frozen yogurt and countless toppings to choose from. Popsicles are making a comeback at Le Pop, a small shop that sells 'gourmet iced lollies'. Create your own popsicle by picking your popsicle flavor, your dip and then add some fun toppings. Choose from cream pops like Chocolate Marvel and Salted Caramel or ice pops like Roasted Pear Sorbet. Follow your nose to Breadworks where the smell of fresh baked pastries and bread float out the door and into the air. The shop has some of the best pastries in Boulder from scones, to lemon bars and bear claws. They bake fresh bread daily and will serve you up a sandwich or even a warm piece with butter. This is a perfect place to start your day. Boulder is constantly growing and changing along with the restaurants, desserts and sweet spots throughout the city! We fell in love with boulder for the outdoors activities like hiking, the friendly people and the tasty food scene. Planning a trip soon? Check out the Hotel Boulderado!